Recently author Milton Davis was nominated for a 2017 British Science Fiction Award (BSFA)for his short story, The Swarm. As explained by the organization, “The BSFA Awards are awarded each year to the best Novel, Short fiction, Artwork and work of Non-Fiction as voted for by the members of the British Science Fiction Association.” The Atlanta based author’s story appeared in Luna Press Publishing’s steampunk anthology Steampunk Writers Around The World – Volume I, along with numerous other submissions from writers across the world. We recently caught up with Davis for a quick chat about the award nomination. BlackSci-Fi.com: How does it feel to be nominated? Milton Davis: It feels good to have your work recognized. Although like most writers it’s not the reason I write, it’s always special when a person or persons take the time to pay respect to your words. 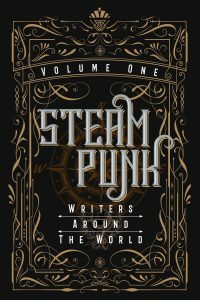 BSF: Talk a little about the anthology, its goal of being the “Steampunk Hands around the World” project? MD: I’ll share the publisher’s words for the explanation: ‘This bilingual anthology is the product of the first ‘Steampunk Hands around the World’ project, created by eleven international authors. It encouraged writers to engage with each other and to express how Steampunk, though global, is born from the unique culture of its setting. This anthology is half in Spanish and half in English. BSF: What is the “The Swarm” about? MD: In the Swarm, horro (warrior) Famara Keita is sent by the Elders of Timbuktu to investigate a vicious swarm of locust that’s devastating the Sahel, the grassland region separating the Sahara from the Sub-saharan forests. The behavior of the insects seems unusual and Famara discovers their terrible secret. BSF: How is your following on the international front with steamfunk? Do you see a difference in terms of feedback/ reaction to your work with European vs. American audiences? MD: I seem to have a significant following in Europe as well as South America, specifically Brazil. Although the response has been positive throughout the world, the reception outside the States has been more enthusiastic. BSF: For readers new to Steamfunk, how would you describe the genre to them? MD: Steamfunk is speculative fiction that has its roots in 19th century African/African Diaspora aesthetic. It incorporates elements of alternate history, science fiction, horror and other forms of fiction to create unique, fresh and exciting stories. BSF: What happens from here? Will there be a possible ceremony to attend? Also what other plans do you have for contributions to the steamfunk genre? MD: If by slim chance that I do win, there is a ceremony to attend. As far as Steamfunk is concerned, I’m in the process of completing my From Here to Timbuktu series. There are plans for a new Steamfunk anthology, as well as a Freedonia anthology and a new series. So my Steamfunk storytelling is far from over.